Just Jingle: Stampendous Saturday! - Color Challenge Week 3! It's Stampendous Saturday and you know what that means! We are playing with this months fabulous color challenge! This month we are playing with Pink, brown, cream and gold! Choose any three colors and CREATE! 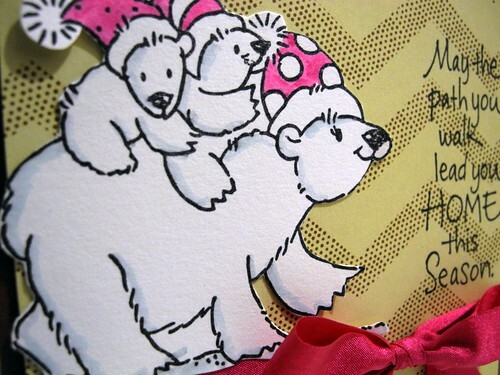 I pulled out the Cling Polar Bear set for today's fun little card! The background paper is from American Crafts. I stamped the image, colored it, and cut it out and I really love how it stands on that background. The sentiment is stamped directly onto the card background. Here is the list of Stampendous! Chicks participating this week! Don't forget to link up your take on this months color challenge for a chance to win some great stamps! You can link up on any participants blogs and it will show up on all of them! YAY! What a super sweet card! Love the bear family on their way to their holiday celebration! I love that!! The bears are so cute and the message is delightful. Beauty!!! The zigzag (NOT chevron) paper is so nice with the image! 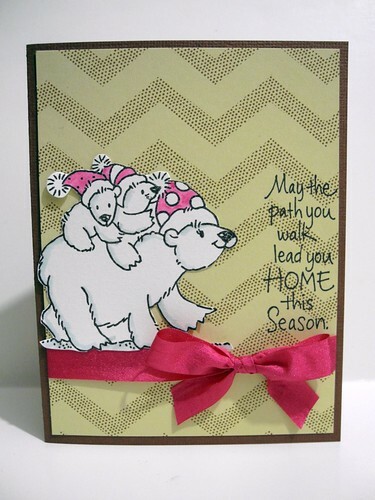 how stinkin CUTE are those polar bears with that chevron (i mean zig zag- wink) pattern paper! This is too cute! Love the bears and the sentiment! that is so cute, I so love that sentiment! Loving the polar bears with pink hats! So cute! Eeek, this is just the cutest, Jennifer! I love the chevron background the pops of pink. Super cute! Love, love. What an adorable card!! So cute! This is an adorable card! Love the polar bears and sentiment. awww - how cute are those bears!!! such a sweet sentiment too! Finally, I got my act together and submitted something for one of your challenges! Merry Christmas Jingle! Your blog is full of super cute cards!! !